Guess what? 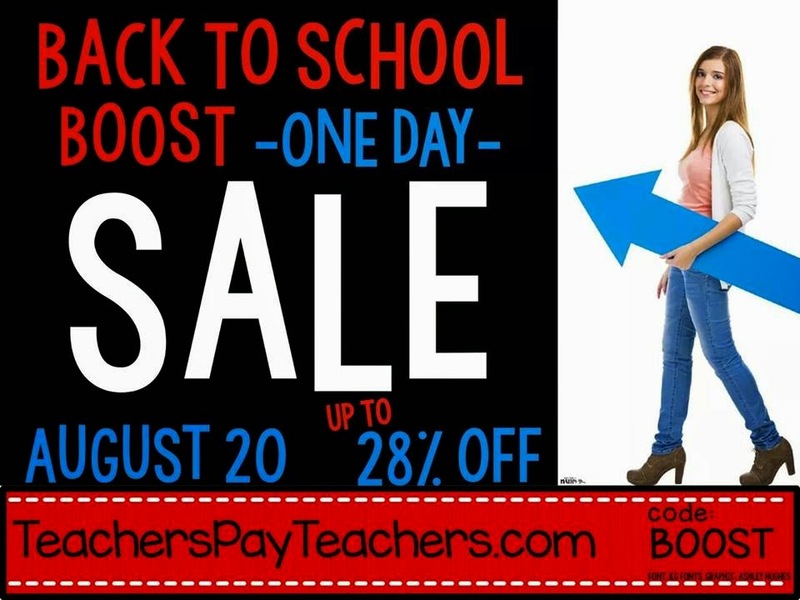 Usually TpT (Teachers Pay Teachers) just has one back to school sale, but of course people in various states start back in early August while in other states & most Canadian provinces, we go back closer to the beginning of September... then there are the year round schools or "Balanced Calendar". This year the web site team surprised sellers AND buyers alike with what they're calling a BTS "Booster" sale. It's one day only.... tomorrow! I know, call me a goody-two-shoes, a Pollyanna, a "good girl" but I really hate that people SELL stuff with a trademarked name & format that is so clearly borrowed. In your own class, for PURE educational use, you have the right... but I wanted to offer something that was ready-to-go but not infringing on anyone's intellectual property. I've got my own funky theme music embedded in the file, and timed transitions (where necessary) and the whole shebang. So, for grade 8 History in Ontario, check out this resource for checking understanding of the key content in the development of Western Canada. I plan to make one for other chunks of our History curriculum, but honestly... my To-Do list is getting so long, it will never, ever be finished! Here's the good part though... it's a PowerPoint file. You can edit the questions yourself. Change a question that you don't love the wording of... swap out a few... or create your own set on ANY topic and use it in your class! So you don't really have to wait for me to make any other question sets at all... if you teach about the Development of the West, buy this product on sale and you're good to go! This assignment gives students an opportunity to really show their critical thinking and ability to synthesize information, as well as research examples to support their own ideas for tacking the social injustices of the world. I'll be honest... 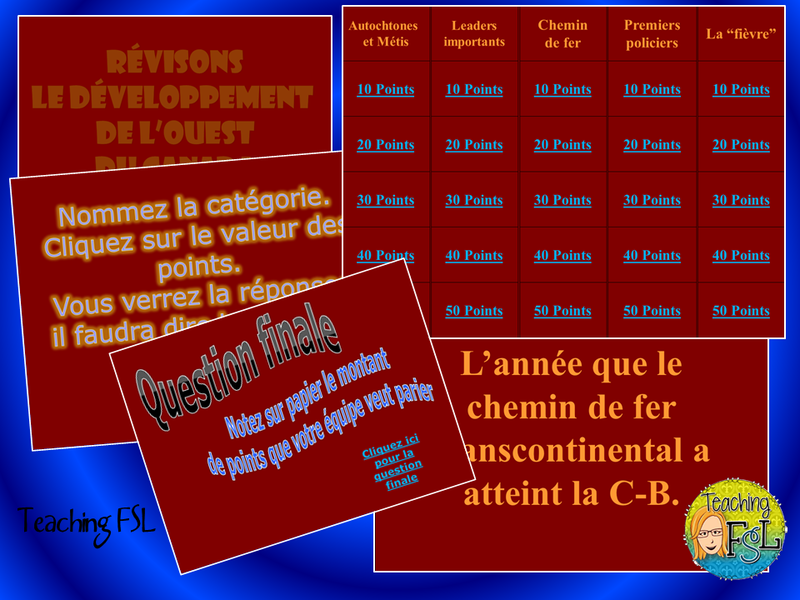 I still have to make a little tweak to re-align it to the expectations as they are worded in the curriculum we're implementing this year, but those of you who know me know that even if the WORDING on the expectations comes from the old curriculum, I was already well familiar with the new French expectations and keeping those very much in mind when I developed this assignment for my class to use last year. 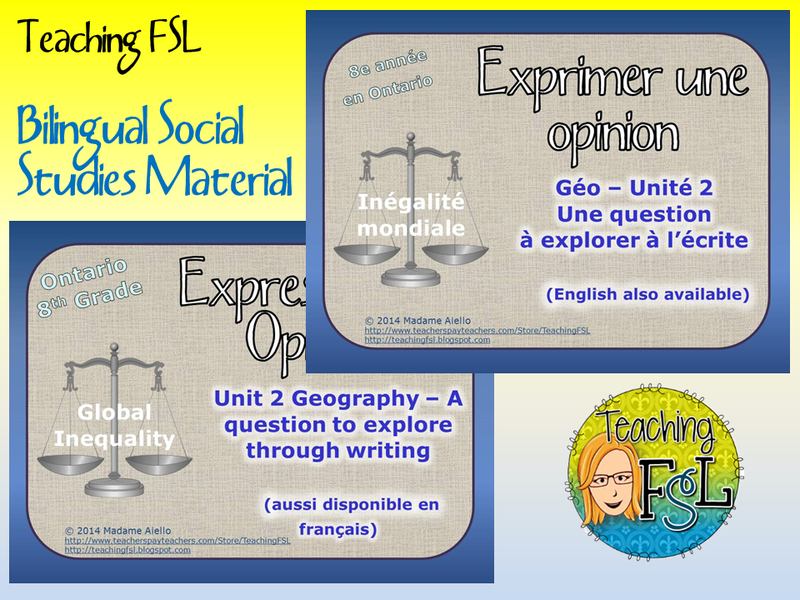 Be sure to look for the bilingual FREEBIES you can use in your Social Sciences classes as well. I've got two (available in both English and French) so far and if I see that there's interest, I'll keep on making them. So, head on over and take a look at your wishlist... is there anything there you need to pick up before we go back to school? Sale prices are scheduled to kick in at midnight tonight! Happy shopping!